Opening session of the 57th Dornbirn Global Fiber Congress held in Dornbirn, Austria, in September. 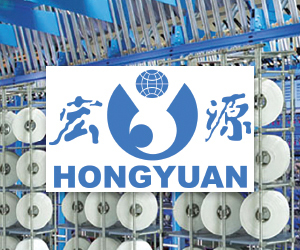 With global fiber production now exceeding 100 million tons – and growing at 3-4% a year – non-governmental organizations (NGOs), which focus on all parts of the textile value chain, are increasingly drawing attention to the fiber industry and producing unfavorable, critical reports. Textile products are placing huge pressures on the Earth’s resources and polluting the environment. As a result, all fiber producers will have to contribute more to sustainability issues than they have previously. 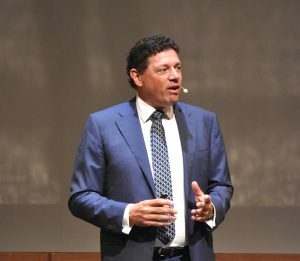 Speaking at the 57th Dornbirn Global Fiber Congress in September, Robert van de Kerkhof, president of the Austrian Fibers Institute and chief commercial officer of cellulosic fibers producer Lenzing, said that with the growing awareness of sustainability led by designers and consumers, the time for the fiber industry to act is now. 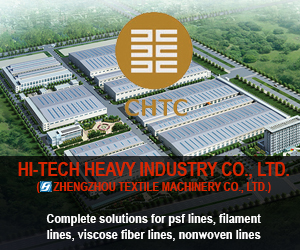 “Fibers are used to make great technical products and help to save lives, providing comfort and protection,” he noted. “But pollution and environmental crises are forcing us to re-think our economy. “For example, nine million tons of plastic waste end up in the ocean every year. The textile industry alone produces 1.2 billion tons of CO2 equivalents a year, and by 2030 the total waste from fashion is forecast to reach 148 million tons. Robert van de Kerkhof, president of the Austrian Fibers Institute, organizers of the Dornbirn Global Fiber Congress. Van de Kerkhof said the fiber and textile industry needs to prioritize resource projects and think about product and business innovation, as well as conduct more work on recycling. There is also a need to focus on life-cycle assessments and sustainability analyses, which means creating partnerships and cooperation, and thinking about circular business models. The circular economy was another underlying theme of the congress. 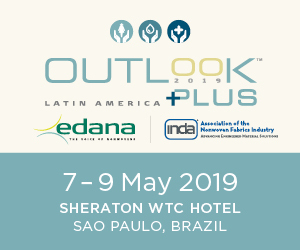 Many initiatives have been put forward that focus on different areas of the value chain, from sourcing of raw materials, through production and use of fibers, to end-of-life issues, such as disposal, recycling and reuse, which are now increasingly being considered. Necat Altin, president of CIRFS, the European Man-made Fibres Association, explained that the circular economy provisions will require the fiber industry to minimize waste, encourage the recycling of textiles, reduce energy consumption, reduce emissions to air, water and soil, and reduce water usage. He warned that European authorities are increasingly being pressured by emotive issue that are led by NGOs, rather than by science. And while Europe, with an annual manmade fiber production of just 3.6 million tons in 2017, is a relatively small producer in global terms, it does have a diversified fiber production base. 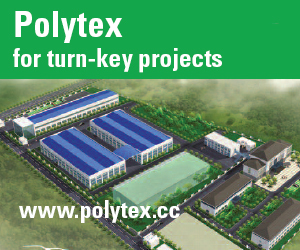 Europe is the world’s largest producer of polypropylene fibers, the largest exporter of acrylic fibers with the world’s largest single-site production units, a global leader in polymer-modified fibers (flame-retardant, bioactive, etc. 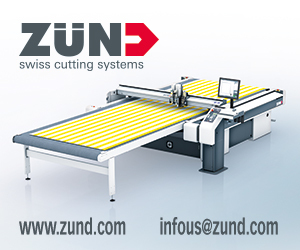 ), a leader in clean production techniques and a frontrunner in green production and the circular economy. Altin noted that natural fibers by themselves cannot meet increasing global textile fiber demand. Manmade fibers use less land and water, do not require pesticides or fertilizers, and cause less pollution than natural fibers. Meanwhile, certain manmade fibers, such as cellulosic fibers, are produced from natural, renewable and certified resources and are biodegradable. European manmade fiber production uses less than 0.1% of global oil production, and these fibers are increasingly made from recycled materials or other natural raw materials. On the environment and sustainability, more is being done as part of cradle-to-cradle thinking, he said. For example, there is now a voluntary agreement to reduce manmade fiber release from the laundering of clothing, and energy/water use, chemical use and emissions are being further reduced. Recycling is increasing, such as PET containers, fishing nets and carpets, as well as the use of cotton linter and old clothing. New mechanical and chemical recycling possibilities are being developed, together with research into the separation of fibers in complex, mixed fabrics. 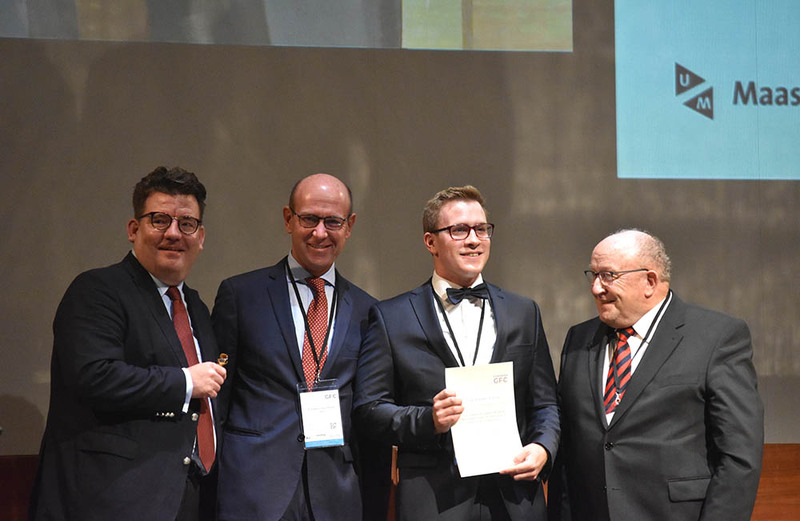 Left to right: Prof. Gunnar Seide, Maastricht University; Frédéric Van Houte, director general, CIRFS; Dr Alexander Weise, RWTH Aachen Institute of Textile Technology, one of the two winners of the Paul Schlack/Wilhelm Albrecht Prize 2018; and Prof. Hilmar Fuchs, STFI, Germany. During the CEO Panel, which featured board members from leading European and Asian fiber producers, Altin, who is also general manager of polyester yarn producer Korteks and vice-president of Zorlu Holding, pointed out that sustainability is as an issue for the whole textile chain, not just fiber producers. As part of this lively panel session moderated by Walter Woitsch of Syngroup Management Consulting, Uday Gill, CEO Fibers of Indorama Ventures, said it was his, post-war generation that had disrupted nature, being heavy on resources as consumers. “We are very inefficient at using resources,” he commented. “However, there are technologies coming up to reduce waste and make our [production] systems more sustainable and profitable. Stefan Braun, CEO of acrylic fiber producer Dralon, said sustainability is a key driver of change, while the industry needs to focus on green chemistry rather than fossil fuels. Retailers should consider the mix of polymers and the dyestuffs and pigments used, and to design clothing and other textile products that are easy to recycle at their end of life. “The key is to develop more closed-loop technologies that are sustainable,” Sharma said. 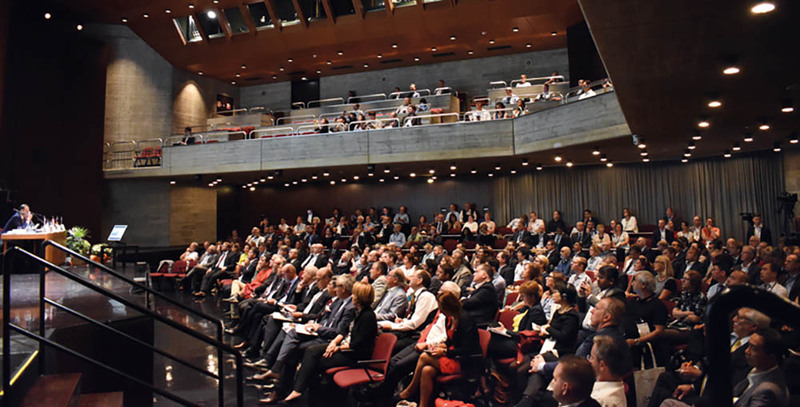 The newly rebranded fibers congress attracted more than 700 participants (70% from Europe) from over 30 countries who heard more than 100 lectures, with around 50% of the presentations from industry and 50% from academic and research institutes. The opening session featured an interview with James Holbery, device research scientist at Microsoft, on the issue of how smart textiles will change the world and what does Microsoft expect from industry. The US-based multinational technology company now has a full-time textile development laboratory, which is looking at soft materials and e-textiles, particularly for health and wellness as well as sportswear applications, and trying to build e-textiles into devices. Also during the opening session of the congress the Paul Schlack/Wilhelm Albrecht Prize 2018 was awarded to two young researchers. Dr. Alexander Weise of RWTH Aachen Institute of Textile Technology (ITA) received the award for the development of graphene-modified multifilaments for the construction of textile electrical storage and Dr. Christoph Rieger of the German Institutes of Textile and Fiber Research (DITF/ITV Denkendorf) was recognized for his project on the development of a manufacturing system for high-temperature stable meltblown nonwovens and their characteristics. The congress also featured an expert panel discussion on the circular economy, as well as the third Young Scientist Forum. 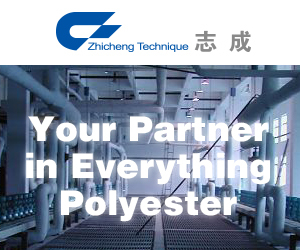 Initiated by lead sponsor Lenzing, the European Man-made Fibres Association (CIRFS) and the German Chemical Fibers Association (IVC), the congress has now established a cooperation with EDANA, the international association for the nonwovens and related industries, and partnerships with Messe Frankfurt’s Techtextil and Avantex events. 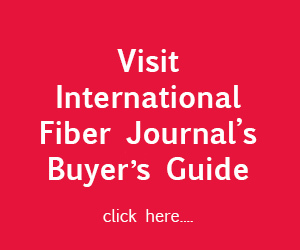 Companies and organizations interested in making a presentation should email the Austrian Fibers Institute, including the working title, short summary and contact details.